Although it was not specifically identified, one of the first references to a Three Drives pattern was outlined in Robert Prechter's book, "Elliot Wave Principle." 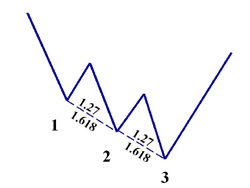 He described the general nature of price action that possessed either a three-wave or a five-wave structure. 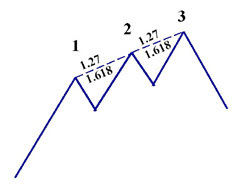 Adapted from this principle, symmetrical price movements that possess identical Fibonacci projections in a 5- wave price structure constitute a Three Drives pattern. The patterns importance of other larger retracements and projections improved the accuracy of the pattern in real trading situations. The book was one of the first to emphasize the the critical aspect of this pattern that each drive complete precisely at consecutive harmonic ratios - either a 1.13, 1.27 or a 1.618. Also, the price legs should possess clear symmetry with each drive forming over equivalent time periods.